In order to understand both the molecular mechanism of the ribosome-catalyzed transpeptidation and the initial conformation of the peptide to be synthesized, it is vital to have knowledge of the conformation of the reacting substrates in the ribosomal PTC. Unfortunately, however, there is no direct evidence regarding the conformations of the tRNA 3'-termini and the adjacent aminoacyl residues at the reaction site. As regards the acceptor substrate of the reaction, some information could be obtained by studying puromycin and its analogs. 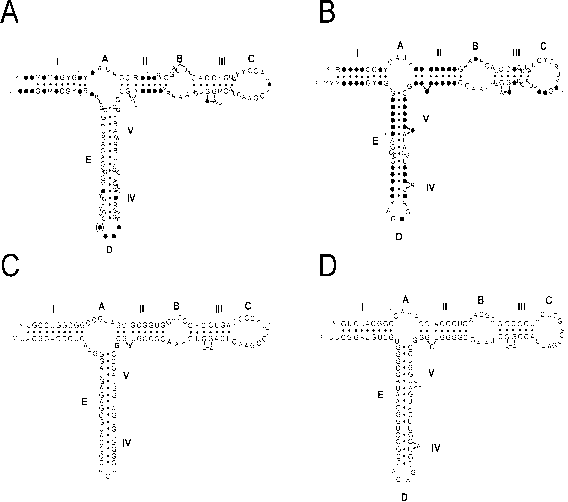 The conformation of puromycin in crystal has been solved by X-ray analysis (Fig. 11.3), and confirmed by studies on puromycin in solution. Because puromycin is a good acceptor substrate in ribosomal transpeptidation, its structure may provide some information about the stereochemistry of aminoacyl and adenosine residues in PTC. At the same time, on the basis of general considerations, one may propose that all types of aminoacyl residues of the acceptor substrate, on one hand, and C-terminal aminoacyl residues of the donor substrate, on the other, are positioned and presented to each other by the ribosomal peptidyl transferase center in a standard equivalent fashion, independent of their type. Using this principle as a guideline, some conclusions about the conformations of reacting substrates on the basis of purely stereochemical analysis may be attempted. First, it should be remembered that the ribosome catalyzes transpeptidation with the proline residue as a substrate. In contrast to other amino acids, proline has a sterically limited angle of rotation around the Ca-N-bond, since this bond is involved in the ring structure. In the case of the proline residue in the donor substrate, this limitation will set a fixed angle, equal to about 60*, between the plane (Ni-Cai-C'i) and the plane of the adjacent peptide group (Ni-C'i-1-O'i-1) (Fig. 11.4). In peptide chemistry, the angle given by the rotation around the Ca-N-bond is designated as j; in this case its value is taken to be -60* since the plane of the peptide group is turned 60* counterclockwise when viewed from the Ca-atom. Since an amino acid residue should be positioned in the peptidyl transferase center in the standard way, angle j should be adjusted to the same value by rotating it amund the Ca-N-bond for each of the other 19 types of residues of the donor substrate (the C-terminal residue of the nascent peptide bound to tRNA and participating in transpeptidation is under consideration). It follows from reaction chemistry that transpeptidation involves a nucleophilic attack on the carbon atom of the carbonyl group realized via the mechanism of Sn2 substitution. 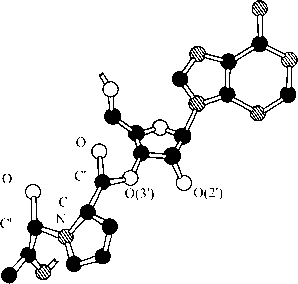 Such an attack is known to proceed approximately perpendicularly to the plane of the ester group (Fig. 11.5 A). The attack should lead to an intermediate wherein the valence bonds of the attacked carbonyl carbon C'i of the donor substrate are oriented tetrahedrally (tetrahedral intermediate) (Fig. 11.5 B).